Kingfisher Lodge - Gold Award winning luxury lodge with hot tub available. Ground floor king bedroom and family wet room, with shower and bath. Fully equipped kitchen including dishwasher and fridge freezer. Open plan living/dining area with wood burner, Freeview TV, DVD/CD player and board games, leading to private decking. First floor double bedroom with en suite bathroom. First floor mezzanine with bean bags, double sofa bed and door to front balcony. Spacious utility room with washing and drying facilities, and cycle storage. This was our 3rd xmas at Millmeadow. Alrhough we only live a couple miles away it's just perfect. We get together as a family and its the perfect location. We had a lovely warm welcome from Suzanne and Chris. Theres everything you need to get you started plus special little touches .... like presecco, milk, apple juice and home made gingerbread xmas trees. The lodge is so well equipped. The wood burner was lovely too , although it wasn't particularly cold the wood burner was used , it was so cosy.we also had the hot tub which is always a hit. The place is so well kept and the owners really make sure your stay is PERFECT ! Three Christmas's in a row is a record for us, its wonderful you live minutes away but feel you are in a totally different place and we can look after you. It was fun getting the lodge ready for you all and so delighted you had a happy family Christmas once again. Have a great 2019. We stayed at Mill Meadow when we sold our house and had to stay in temporary accommodation before we bought our new house. Mill Meadow gave us the flexiblity to stay as long as we needed without being tied to a letting contract. 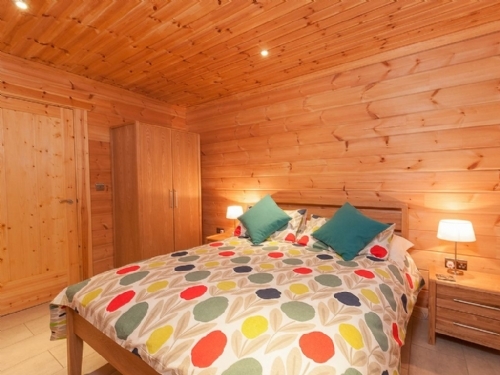 It also had the benefit of of no utility bills or council tax to worry about so it was the perfect place to stay with the benefit of being in a lovely timber lodge set within beautiful surroundings. We stayed at Kingfisher lodge whilst visiting for a wedding. The booking process was simple and clear. The hosts Chris and Suzanne were very helpful during our stay also. The lodge was spacious, clean and very well thought out and kitchen was well equipped too. A lovely spot and we were sad to leave. We look forward to booking a visit again soon. Kingfisher was a very lovely place to stay during holidays! My family had a wonderful time there. Suzanne and Chris were so kind in providing welcome drink and cake to us upon arrival. Kingfisher was quiet and comfortable. The kitchen facilities were excellent and we cooked our breakfast every morning. We all enjoyed staying there. We would certainly return for holidays again in the future. Our stay at Kingfisher Lodge was lovely and relaxing. Very good facilities, clean and very well organised. Family run business very friendly and helpful. Good use of fishing and hot tub. Would book again in a heartbeat. Would most certainly recommend staying there. We were so lucky to have found this wonderful selection of eco-lodges. Each one is unique in its look and our lodge had everything you could hope for in a home away from home. It is beautifully decorated, well stocked in terms of kitchen equipment, and the bedrooms were extremely comfy. The teenagers made full use of the hot tubs and WiFi ! Would thoroughly recommend to anyone. We have just enjoyed a lovely break away at Mill Meadow, staying in the Kingfisher lodge, after a last minute booking. The hosts were very accommodating, and the standard of the lodge very high. A really well equipped kitchen and utility room made it feel like a real home from home. Inside and out the lodges are beautifully presented with fresh flowers, home made flapjack, milk, tea, coffee and local apple juice to welcome you on arrival- a nice touch. Our lodge was pleasingly private and the addition of a hot tub added more luxury. It was also well maintained (checked twice daily) and very clean. The lake and summer house on site were great if you didn't want to go too far but still wanted to enjoy the sunshine in peace and quiet. It was a wonderful place to relax. Would certainly recommend. Been here before so knew what we were going to. The place is ideal for dog walks and a local pub. Pretty cool for a timber house when it was 28 degrees every day for a week. Only slight draw back was the comfort of one of the sofa beds on the mezzanine. A beautiful chalet with a real luxury feel in an idyllic spot - surrounded by woods with beautiful walks. Great place and very relaxing for a family of 5 persons. Stay there for a wedding ceremony at Taunton. Beautiful area and wonderful views of the Somerset countryside. We stayed at Kingfisher Lodge for six nights for a family get together. Excellent is all I can say. I would highly recommend and will definitely visit again. Never a thing out of place and if you need anything you only have to ask. We are regular visitors as our Son boards in Taunton. Walks, pubs and close to Taunton town centre. My second visit to Mill Meadow, this time staying at Kingfisher. The lodge is absolutely gorgeous and very comfortable, everything you might need has been provided for, including a sunlounger, which was much appreciated with the lovely weather we had. All in all - brilliant. Had an amazing time here. Could not find fault with anything. Loved the homemade flapjacks on arrival. Beds were so comfy, best nights sleep in a long time. Enjoyed the hot tub. As noted above a frequent visitor to MM and again did not disappoint, Suzanne and Chris great hosts and lodge was perfect, looking forward to visit no7! We stayed at Kingfisher lodge and thoroughly enjoyed our time there. The location gave easy access to days out suitable for children. We particularly enjoyed the style of the lodge which is quite unique and made the stay interesting. The hot tub made the experience even better and our children loved it. Kingfisher was well furnished to a high specification. The log burner wasn't really needed but we used it just to try it out otherwise the house was pleasantly warm all of the time. The area is quiet and you won't be disturbed by other guests in the vicinity. We'll be back again for sure & we recommend a stay here without any hesitation. Very relaxing place to stay/visit. I have reviewed 2-3 times so not much I can add, we keep coming back and will be back again next year if not before. A fabulous stay at Kingfisher. Everything we needed and more. Great hosts and a beautiful setting. Thank you! Our 3rd stay this year. Probably the most relaxing place we have ever stayed in. Great walks around my favourite county. Town within short drive so nothing is very far. Superb hosts and great setting. Excellent facilities and very comfortable. Good for children. Access for disabled was a little bit difficult as the slope at the side of the lodge was a bit too far for my father in law and the steps were a bit difficult. I know that another of the lodges we have stayed in has a ramp at the front so we should have opted for this lodge - our fault yours. A gem of a place, close to a county City but a million miles away. The only thing that could be improved from a very personal perspective is blackout curtains as the sun wakes me up as a light sleeper, handy for the early morning fishing though, which I don't want to go into. Our second visit in as many weeks and will be back later this year. There is so much to do and explore in the area, great for families and couples, in fact anyone all ages. Living in Hong Kong, it's fair to say Mill Meadows is the opposite spectrum. I'd certainly recommend it and I am sure I will be back again and probably this year. Somerset is a wonderful county and so much within easy reach. Fishing is awful ( it isn't really but I'd like it kept quiet), great for youngsters learning. My Son Boards close by so best disclose this. Kingfisher Lodge is a beautiful retreat in a unique, green setting. It has all the equipment you need to make your stay comfortable (for both guests and dogs). The hot-tub is excellent. Rooms are spotlessly clean and the owners help you with any special needs/requests to make sure that your stay runs smoothly. It is conveniently near to Taunton, the Quantocks and beyond! The sun was out and the birds were singing. The house, well you could not wish for more. We thoroughly enjoyed our stay and having use of the summerhouse and easel for artwork! Chris and Suzanne were excellent hosts and nothing was too much trouble for them. Kingfisher is lovely and we especially liked the fantastic woodburning stove with logs provided, for colder days and the mezzanine and sofas to relax in. Our only constructive comment would be that it would be good to have more wardrobe space upstairs for hanging clothes. Perhaps a chair or stool in the downstairs wet room would be a useful addition. This is an excellent lodge for two couples which we were. We could not have asked for a better place to stay for 4 nights during a cold, crisp, frosty January. As soon as we walked in we were struck by its warmth and cosiness - the underfloor heating was a complete treat for us. 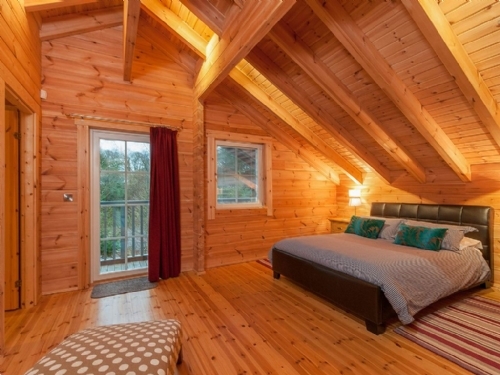 The lodge is spacious and uncluttered but still retains a snug atmosphere. The decor is simple and stylish and the large modern bathrooms are immaculate. The kitchen is fully stocked with good quality equipment and the upstairs den area provides a great space to relax. With temperatures below freezing, I didn't think we would be rushing to use the outdoor hot tub. But we were soon risking a short chilly dash across the 3m which separates the hot tub from the front door, to immerse ourselves in the hot bubbling water. Another huge treat. Mill Meadow is brilliantly run by Chris & Suzanne, who answered every enquiry immediately, both before and during our stay. Overall, I highly recommend a stay at any of the fabulous Mill Meadow lodges, with a particular recommendation for Kingfisher Lodge. Mill Medow is wonderful , this is the secound time I have been here and it certainly won't be the last . Fabulous hosts and surroundings . We came over for Christmas with my family and brought my French partners 2 children for their first UK Christmas! They were in heaven! They enjoyed the area and being so close to all amenities we never felt isolated with a young family..they loved the chalet style and couldn't keep them out of the Hot Tub! Very warm inviting comfortable house!! We even had a Christmas tree all decorated on arrival..lovely touch!! As a large family of 4 with dogs as well it was a perfect spot to enjoy all the local countryside and great walks. Our host Suzanne and Chris were just fantastic and always available if needed for any support or advice! Thank you for making our Christmas one we all won't forget!! We have returned from a wonderful stay at the Kingfisher lodge. From the moment we arrived, we were looked after by Chris and Suzanne, who are great hosts and take great care to ensure your stay is as enjoyable as can be. The hot tub was the star of the show and is a wonderful place to relax after a hard day watching junior cricket! We cannot wait to return next year! We are a family of 4 and had a lovely, peaceful long weekend in the Kingfisher lodge. It felt so comfortable that even the kids were planning on moving in! Lodge very well kept and had everything you needed. Our four children could not have arranged a better celebration for us than the long weekend we and our our extended family of 15 plus 2 dogs, enjoyed at the Mill Meadow from 1st to 4th April this year, 2016. They selected this locality as we were married in St Mary's church in Kingston St Mary in 1966 when Merryn's parents lived at Timbercombe House, 4 miles away up on the edge of the Quantocks. Sue was was very good at settling us and our dog, Jess, into "Kingfisher" and, later, we were delighted to receive celebratery chocolates and flower from Sue and Chris- such a kind action. Doug and Merryn Smith . Stayed here for 5 nights whilst visiting family. The lodge itself is immaculate and extremely well equipped. Surrounded by beautiful countryside ,it is dog friendly and a wonderful place to relax and enjoy nature. Suzanne, the lodge owner/ housekeeper is very friendly and helpful. We didn't use the hot tub, but I imagine it is great, we will hopefully be back and take advantage of it. Mill Meadows is easily accessible from the M5 yet you feel like you are a million miles from the outside world, it’s the perfect get-away. The lodges are nothing short of amazing; clean, modern and luxurious. My only minor gripe would be that check-in isn’t a bit earlier, perhaps 3pm. That said, we will definitely be returning! A group of us booked 3 lodges for the Christmas period. They were lovely and it was a great way to spend the festive period. The kitchens were all well stocked with utilities. Would recommend. The Kingfisher Lodge was in excellent condition, with everything as advertised and in full working condition. We were greeted and given a full run down of how everything worked, which was very useful. We really enjoyed our stay there. The surroundings are amazing, and the little pub in the village is well worth a visit. I would definately recommend staying at Mill Meadow, and i am sure we will return at some point in the future. We had a lovely relaxing time. Hot tub was fab. Jean who greeted us and showed us round was great. Definitely be visiting again. A modern luxurious cabin the best we have stayed in. Jean was fantastic and very helpful, she even left a bottle of prosecco on the table the next morning, very lovely, personal touch. The kitchen was perfect and contained everything we needed. Jo was very efficient when we ran out of wood for the log burner. The bed was comfortable with lovely cosy duvet and pillows. We cant express enough how satisfied we are with MillMeadow. Set in a beautiful location by the private lake, stunning views and very quiet. The lodges are of high quality and fitted out to a high standard. The staff are amazing and very friendly. This is a place we plan on coming back to many times. We stayed for 5 nights at the beginning of October. Had a warm welcome and were shown around the lodge which was very impressive. The kitchen was fully equipped and we did not want for anything. The wet room was fantastic, the bed was comfortable and we had a great stay. We will def' return and have already recommended it to a number of friends. We came as a group of 12 and stayed in two of these beautiful lodges between the Friday and Monday. We couldn't of asked for a better stay, we arrived to an immaculate lodge and a tub of freshly baked cookies and anything we needed over the weekend was not too much trouble for Suzanne. The surrounding area is lovely with all amenities within a close walk or drive. I would highly recommend Mill Meadow as the lodges are fantastic and the customer service provided from initial enquiry to the day we left was brilliant. Thank you for making my best friends hen weekend one to remember. We had a wonderful stay at Mill Meadow for my wedding with the family. Could not fault it at all! We had 3 lodges in total. We were made very welcome with some goodies in the fridge. The rooms were very comfortable and spacious and the setting and surroundings were beautiful. A wonderful relaxing place to get ready for my wedding day-many thanks! Great property. Hot Tub was an added bonus. Difficult to get into the hot tub, the steps seemed to be at the wrong side, so you were stepping into a deep place, the staggered steps were at the other side of the hot tub. Definately a lack of "hooks" to hang things on, especially in the bathroom on the ground floor. No where to hang your dressing gown or towel. The lodge was a very nice place to stay - very quiet, peaceful and private. The only downside was that sound travelled very easily between the ground floor and upstairs bedroom. It would be very difficult for anyone to sleep on the mezzanine whilst anyone else was up, either in the evening or in the morning. I couldn't find any scales which would have been useful, failing that a standard size tablespoon would have helped in calculating weights of ingredients. A hand whisk, rather than the tiny drinks whisk, would also be useful. Other than that, plenty of crockery, pots and pans. Our stay at Kingston was wonderful in Kingfisher Lodge. We are french, we came for the second time and we might come for a third time! It was great, thank you again. We booked a 2 night stay at Kingfisher Lodge with our dog Spike for valentines weekend. Very friendly greeting from Suzanne & a lovely surprise of cupcakes, flowers & champagne! 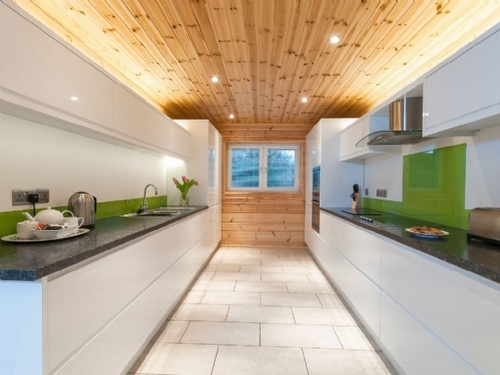 Beautiful lodge, lots of space and one of the most well equipped kitchens ever. We had such a lovely Valentine's Day, a windy dog walk on the fossil beach at Doniford Bay followed by lunch with Spike at Blagdon Inn which has to be the best sea bass I've had & they were so welcoming to us bringing Spike. We then had a couples hot stone massage at our lodge courtesy of Beautyworx a local Taunton business, highly recommended, followed by a dip in the hot tub. It really was a perfect day. The only areas for improvement would be some secure fencing to create an enclosed garden area for dogs & kids to play in, this would also provide more privacy in the hot tub. Also, it would be nice if we were able to leave our dog in the lodge at times when it really is impossible to take your dog, maybe providing dog crates would be useful or a stair gate to fit between the kitchen & dining area as this would also help keep dogs off the furniture during the night which we found a challenge, we improvised by moving the chairs to block access to the sofa lol! Overall it was an amazing stay & would definitely return but maybe without our dog and bring our son instead, bringing both wouldn't be fair on our son as we would have to do dog friendly activities only which are limited. Great value for such a lovely comfortable and clean cabin. Hot tub definitely worth the small extra charge!! Love the log burner after taking the dogs for a nice log walk in the Quantocks in winter months.such a great thing to come home to. Kitchen so well equipped and Suzanne so friendly and helpful and not at all intrusive. We stayed at Mill meadow to celebrate our 10th wedding anniversary with our 4 children aged 6weeks -10years. The lodge was equity with everything you need, it was clean and beautifully presented. There was a basket of logs, kindling and newspaper for the log burner aswell. Customer service from Suzanne was 5/5 and the hine made cookies were lovely. I have been telling everyone about Mill Meadow! Our stay in Kingfisher Lodge was wonderful! Idyllic Lodge in idyllic locations. Relaxing holiday in peaceful location in which to explore Somerset. Experienced lake fishing for the first time and can't wait to go back. Thank you Mill Meadow team. We thoroughly enjoyed our stay at mill meadow and were very impressed with the standard of cleanliness throughout. Wonderful to arrive to fresh milk and home made biscuits after a long car journey. We felt very relaxed as soon as we arrived. The location is excellent for visiting attractions in the area. Hot tub was a real treat after long days sightseeing. Furniture and fittings of a high standard so made us very comfortable and at home. This was our 4th time returning to the wonderful Mill Meadow. Can't recommend highly enough for relaxing, high quality stay or as a starting place for exploring The Quantocks. We had a geat stay, chilling out surrounded by beautiful greenery and lots of little birds. The lodge was spacious, well-equipped and comfortable and the staff couldn't have been more friendly or helpful. They were also flexible and responsive. Worth asking if you want a later check-out. Suzanne and Chris are very much hosts rather than businesspeople, as exemplified by the fresh flowers, home-made biscuits and local apple juice waiting for us in the lodge. Beautiful lodges with excellent facilities. Made to feel completely at home with everything you would ever need and a few extra treats. Mill Meadow couldn’t do enough for us and were on call for all our needs and made us feel incredibly at home. We stayed here for our wedding and it really was the perfect end to a perfect weekend. Thinking of coming back for our one year anniversary! Truly lovely place to stay, enjoyed every second. Excellent location for access to Taunton, picking up someone from station! Good location within Somerset and easy road routes to get around yet still a nice rural location. Plenty of good walks from door with well maintained footpaths, plenty of local information guides available in lodge. Hot tub was excellent having it maintained for you just made it even better!! !